Judy PF, Jacobson FL. Evaluation of segmentation using lung nodule phantom CT images. 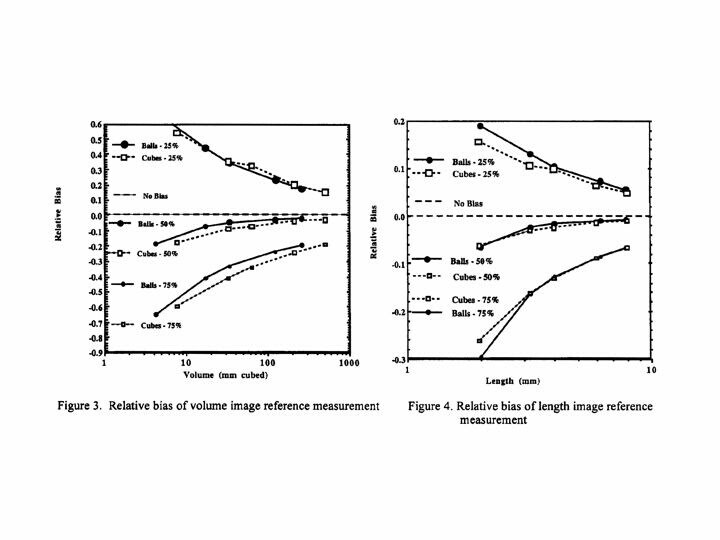 In: Sonka M and Hanson KM., editors, Medical Imaging 2001: Image Processing, Proc SPIE 2001; 4322:1393-1397. Segmentation of chest CT images has several purposes. In lung-cancer screening programs, for nodules below 5-mm, growth measured from sequential CT scans is the primary indication of malignancy. Automatic segmentation procedures have been used as a means to insure a reliable measurement of lung nodule size. A lung nodule phantom was developed to evaluate the validity and reliability of size measurements using CT images. Thirty acrylic spheres and cubes (2- 8 mm) were placed in a 15-cm diameter disk of uniform-material that simulated the lung. To demonstrate the use of the phantom, it was scanned using our hospital's lung-cancer screening protocol. A simple, yet objective threshold technique was used to segment all of the images in which the objects were visible. All the pixels above a common threshold (the mean of the lung material and the acrylic CT numbers) were considered within the nodule. The relative bias did not depend on the shape of the objects and ranged from -18% for the 2-mm objects to -2.5% for 8-mm objects. DICOM image files of the phantom are available for investigators with an interest in using the images to evaluate and compare segmentation procedures.